Louise from Elsie May and Bertha was the first person (and so far, only person...) to sign up for the Shop Swap. She sells lovely little things. 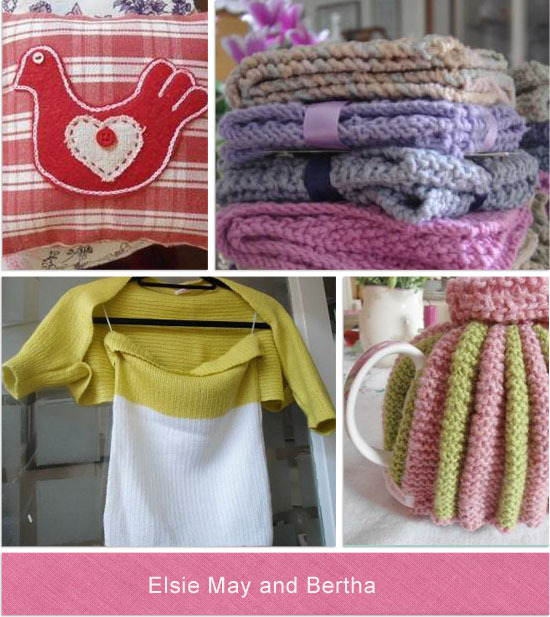 In her words "I make items with fabric, wool, vintage bits and pieces, buttons etc. These can be cushions, clothes, lavender and rose scented hearts, pillows and sachets, pictures, decorations etc". I had a cheeky browse of her shop and her Folksy shop and found much yummyness. I especially loved all her knitted things...probably because I don't knit! Sign-ups for the swap are open until 18 July, so please come and join us. It is just a little bit of fun that really won't take much effort on your part. I would love to see what you make and share some of your loveliness with others. I've not noticed this lovely little post until today (I follow way to many blogs, and I keep finding more I like, I can be practically glued to my phone all day if I wanted!) Thank you. I've just had another look at your sute, you too make some gorgeous things.